The Twain Shall Meet: A Tale of Two Tales: Jim Flaherty Rewarded by Media! 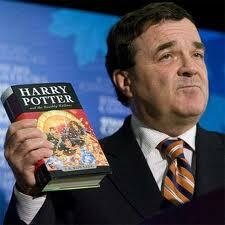 A Tale of Two Tales: Jim Flaherty Rewarded by Media! Tale One: Jim Flaherty has just been named Business news-maker of the year by ...... Canadians in General happy to have his leadership? Well not exactly, But that did not stop the MSM from picking up this ready made story and distributing it verbatim. The Main Stream Media has a lot to learn and a lot to answer for. The early story was thoroughly short on reason. It simply quoted those who for one reason or another did not see anything wrong with Flaherty's dismal stewardship of our economy. "OTTAWA - As the sovereign debt crisis rocked Europe and the U.S. economy spun its wheels with a jobless recovery, Finance Minister Jim Flaherty remained the steady hand at the tiller in 2010 on his way to being voted The Canadian Press business news-maker of the year. They started out with verbatim accounts from a news service, but by now they are adding info and more background on it. Of course many, many Canadians read these things as soon as they come out, and at that point they are virtually identical and and simply a copy of the glowing PMO press release. Most of them never check back to see how public opinion and some time to digest it sways the discourse over the course of a day or two. Here is some of the information that was added later in the news cycle, and keep in mind that the readership decline quite rapidly after a story breaks, and that most who have read it will not re-read it! With the loonie near parity with the U.S. dollar and signs of the economy recovery taking hold, Flaherty could boast of a record better than most of his peers around the world in 2010. "I think what we saw not only in Canada, but around the globe was a very aggressive policy response," said Paul Ferley, assistant chief economist at the Royal Bank. "And certainly the infrastructure program, as well as various tax cuts in hindsight, look like they have been very successful in terms of helping to sustain the recovery." But despite his success in helping keep the Canadian economy on track, the coming year brings even more challenges for the finance minister as the vast majority of the stimulus spending comes to an end and he faces the task of balancing the budget to meet his target of 2015-16. "I think the government did well in terms of identifying just how deep the economic hit was and opted to respond in kind," Ferley said. "Now the fallout from that are a fairly large debt and deficit, numbers not as bad as what we are looking at south of the border or in Europe, but still, imbalances that at some point will need to be addressed." Flaherty has said there will be no major new spending in his 2011 plan, but also there will be no major new cuts either. "In 2010, it became clear that Canada had emerged from the deepest worldwide economic crisis since the 1930s in relatively good shape," Flaherty said. "But we are mindful that the recovery is fragile and there are still too many people out of work. So we are sticking to our plan. " what he thinks is Harper's personal copy of 900 page Omnibus Budget Bill! Tale Two: There were 108 votes by ( ? ? ? ? ). Flaherty got 21 of them and the runner up, Brad Wall who stood up to The Harper Government and in particular Flaherty himself on the Hostile take-over of Saskatchewan Potash, came in a very close second with 19 votes. So, it was not a runaway landslide decision, based on Flaherty's legendary record on the economy after-all? No it was a tight vote and there was obviously no clear winner as Flaherty only got only 19.4% of the vote. I am still looking for a good explanation of who exactly voted, and what the criteria were. OK, it was 108 print and online business news editors and broadcast news directors. Gee that seems like an impartial group eh? Of course I am still looking for details on who actually voted. In even later versions some reservations to the choice are starting to be expressed. The huge deficit that was such a surprise to our boy Jim, the discrepancies between all of his predictions and the actual numbers, and his persistence in taking of all the credit for the work of Paul Martin. The constant criticism of the Office of Kevin page who has always seemed to doubt Flaherty's skills as a Finance Minister. The rampant spending on vote buying projects and the outright lies that they are telling as to the real impact on Canada. No mention of any of this in the early versions however. Not that I am suggesting that any of us stop to think about any of this, and certainly not that the MSM will care if you simply put your head in neutral and play along with this silly little sham that they would like us to call real Journalism. I am hoping that some real criticism will emerge in the Main Stream Media, before the 48 hour news cycle ends tomorrow. It is unlikely, but at least the real media, the people's media (the social media) is already all over this story asking real questions and secretly laughing at the lack of vision, the lack of long term memory and the lack of testicularity displayed by the Finance Minister and by the Canadian Press. This is right on!! I am so fed up with Harper's propaganda machine and the MSM's complicity. They are continuously feeding the public misinformation and spin and that is no way to run a country. It's time for Canadians to speak out. Thanks for doing so on your blog! Nicely said Kim! This *award* granted by nameless people is a complete joke and nothing more than yet another contrived and misleading photo-op for a finance minister who has nicely managed to dump the Canadian taxpayer with the biggest deficit in Canadian history -$56 billion and counting! The Conservatives are taking credit for Paul Martin's sound fiscal management. How disgusting. You are welcome Anonymous although you can still leave your name, lol! It is time that the MSM earned the name Media. Dragging and Dropping the Droppings of the PMO is Not Journalism! Yes it's true Maureen the deficit is $56,000,000,000.oo and counting. Like I said,the real media, the people's media, is taking a closer look at this dubious "award" and will have more to say than these clones. Excellent post Kim; thank you for writing. "Big media is in the driver's seat of big politics,"
said Peter Murdoch of the Communications, Energy and Paperworkers Union of Canada. "It's clear who the government is listening to. It's not just outrageous or appalling. It's scary." CanWest must quit referring to themselves as a newspaper and call themselves what they really are: an advertising brochure. Well said, Kim. I guess those who voted conveniently forgot about the huge bank bailouts. The 'award' is for the future when Flaherty hands out more corporate tax cuts. Wouldn't it be wonderful if the MSM made it the headline and in-depth item with all the features you mention.